This week, I’m taking you back to July, 2006. 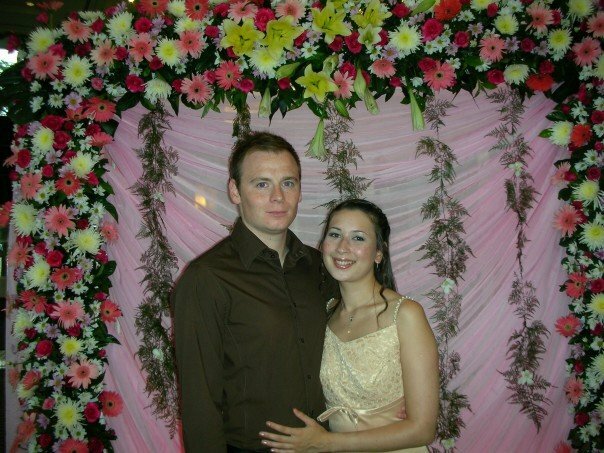 Andy and I were in Thailand for my uncle’s wedding and this picture was taken in the morning before the ceremony. The photo shows us carrying an offering for the bride and groom. We walked around the bride’s home village of Korat and as we passed the homes of local friends and family, they joined us in a procession that led to her house. Each person brought with them a gift of food, money, gold or flowers. When we reached our destination, the ceremony began. Monks prayed for and blessed the couple and the groom’s family gave a dowry to the parents of the bride. My dad in the procession. He’s not smiling as I think the weather was a bit too warm for him. Guests tie a bracelet to the bride and groom’s wrists for good luck. The bride is wearing two flower wreaths on her head which are connected by string. One is taken from her and placed on the groom’s head to symbolise that they are now ‘tied together’. 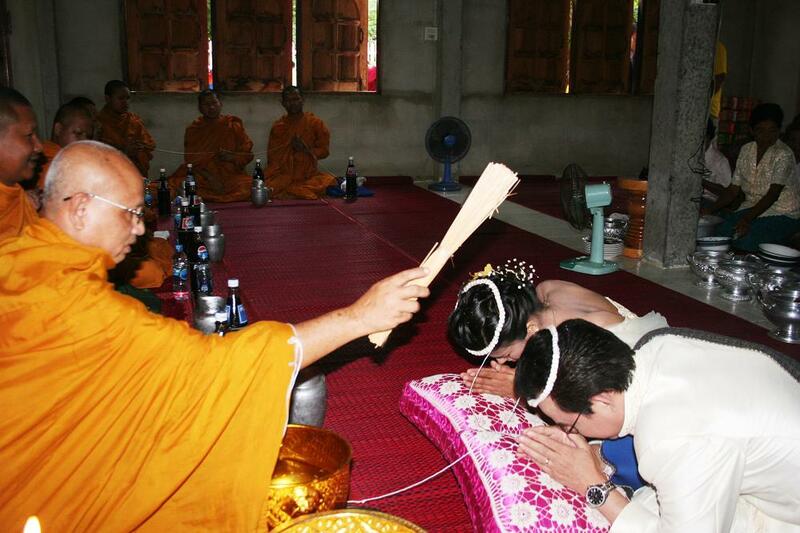 The monk keeps hold of the string attached to the couple during prayers and blesses them by flicking holy water at them. 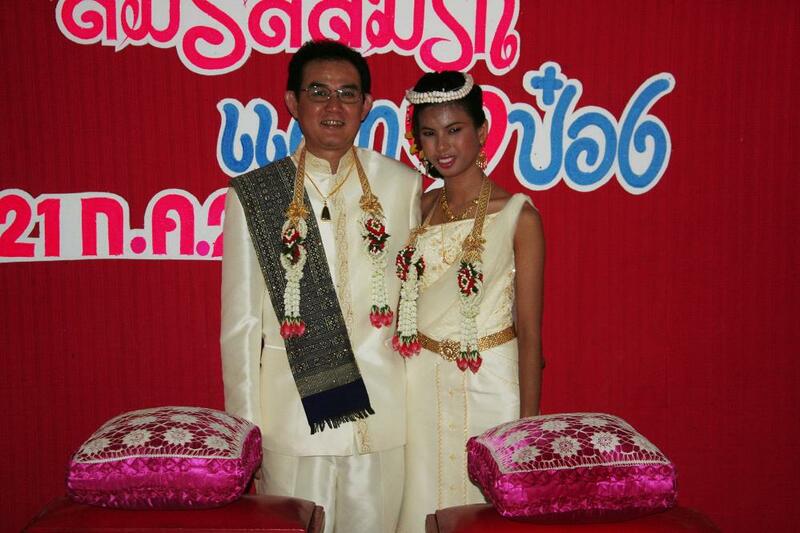 This is why some Thais believe that if it rains on a couple’s wedding day, the heaven’s are blessing them. Below, Andy and I are pictured at the hotel lobby before the evening reception. When our family and friends back at home saw this picture, they thought we had eloped! I think it was partly my dress, although the staged backdrop doesn’t help. But honestly, I wasn’t one of those girls who tried to upstage the bride! I was the Chief Bridesmaid (Maid of Honour) and my dress was no way near as beautiful as the bride’s. Actually, my dress was a lot darker than it appears in the photo. Please let me know if you enjoyed my Thai Throwback Thursday post and stay tuned for next week’s.